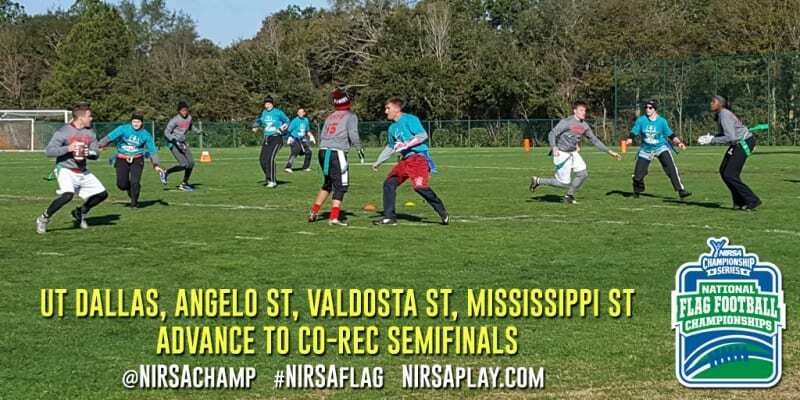 The co-rec semifinals are set after UT Dallas, Valdosta State, Angelo State, and Mississippi State picked up quarterfinal wins early this afternoon. UNC Pembroke and UT Dallas each reached the endzone for six points twice, but teams combined to score on just 1 of 4 PAT chances. That one was the difference as UT Dallas edged UNC Pembroke in the co-rec championship playoffs 13-12. Jonathan Nguyen through for a TD and ran in another for UTD. Kelvin Brim scored a pair of touchdowns for UNC Pembroke in the defeat. UT Dallas will face Valdosta State, who blanked UWF 48-0. Kymesha Andrew scored three times for Mississippi State as the Bulldogs eliminated New Mexico State 36-9. They will face defending champion Angelo State, a 23-9 winner over UCF.